Do you find it easy to come up with lots of ideas for blog posts, but then find it difficult to sit down and actually write them–or spend hours drafting, only to decide that it’s not quite ready for posting? I know what that’s like. On the subway, I jot a few notes for a post I want to write. At home, I add more ideas to my outline. Sometimes when I look at those notes, I think, “What on earth is this about?” Other times, I write a paragraph or two, and then my attention wanders. Over the years, I’ve gotten a lot better at getting posts out there. I still have more ideas than I can write, but at least a few of them make it into my blog! Here’s what works for me, and I hope it works for you too. Capture your ideas. Write them down somewhere: a text file, an Evernote notebook, a piece of paper, whatever fits the way you work. You don’t have to write everything down, but it helps to have a list of ideas when you sit down to write. I use Evernote to take quick notes on my phone, and I use Org Mode for Emacs for my outline. “Oh no! Now I have this huge list of unfinished ideas!” Don’t be intimidated. Think of it like a buffet – you can choose what you want, but it doesn’t mean that you have to finish everything. Pick one idea and turn it into a question. Pick the idea that you’re most curious about, perhaps, or something that you’re learning. Turn it into a question so that you have a focus for your writing and you know when you’ve answered it. Questions help you keep both your perspective and your reader’s perspective in mind. Remembering your question will help you bring your focus back to it if your attention wanders. Remembering your readers’ potential question will help you empathize with them and write for them. Break that question down into smaller questions until you can actually answer it in one sitting. For example: “How can you blog more?” is too big a question. 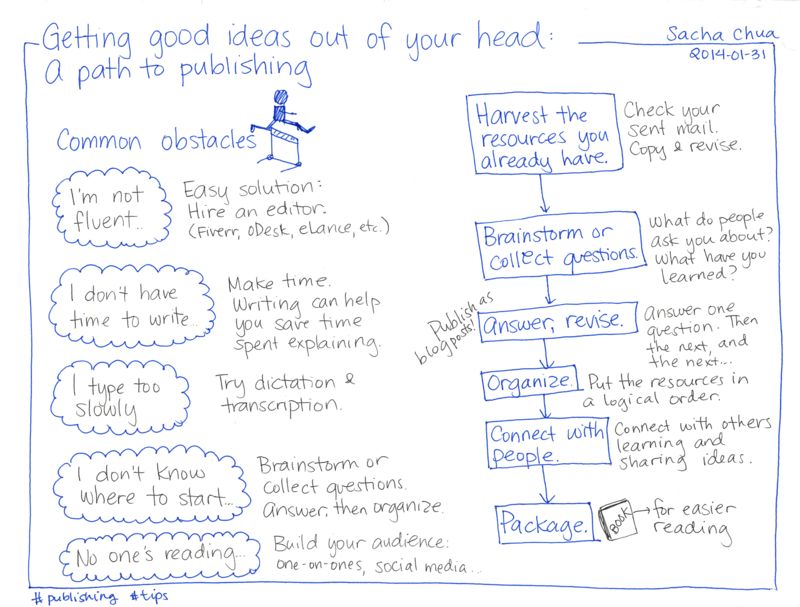 In this post, I want to focus on just “How do you get past having lots of ideas that you don’t turn into blog posts?” Make the question as small as you can. You can always write another blog post answering the next question, and the next, and the next. When you find yourself getting stuck, wrap up there. That probably means that your question was too big to begin with. Break it down even further. Figure out the question that your blog post answers, and revise your post a little so that it makes sense. Post. You can follow up with a better answer later. You can build on your past posts. Don’t wait until it’s complete. Post along the way. I often run into this problem while writing technical posts. I start with “How do you do ABC?”… and get stuck halfway because of a bug or something I don’t understand. Then I turn my post into “Trouble-shooting XYZ” with my rough notes of how I’m figuring things out. I’d rather have written a complete guide, of course, but mistakes and false starts and rough notes are also useful in themselves. Don’t think that you have to know everything and write everything perfectly the first time around. In fact, blogging can be more interesting and more useful when you do it as part of your journey. Tell me if this helps, or if you’re still getting stuck. More blogging excuse-busters here! 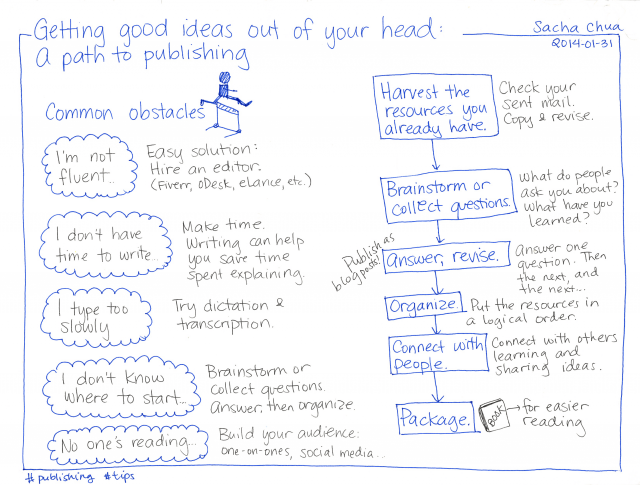 What’s getting in your way when it comes to writing? Pay attention to what you’re learning. Figure out what you think. Focus on what you can’t help but sharing. Turn your ideas into small questions, then answer those. Be clear about your goals and possible approaches. Make sharing part of the way you work. Figure out what you can write better when you’re tired. Get other people to read your posts. Feel free to comment or email with more excuses and tips! I’ve been thinking about different approaches to learning. Some people are specialists, going deep in one topic before moving on to the next. Some people are generalists, learning about many topics and gradually bringing them together. 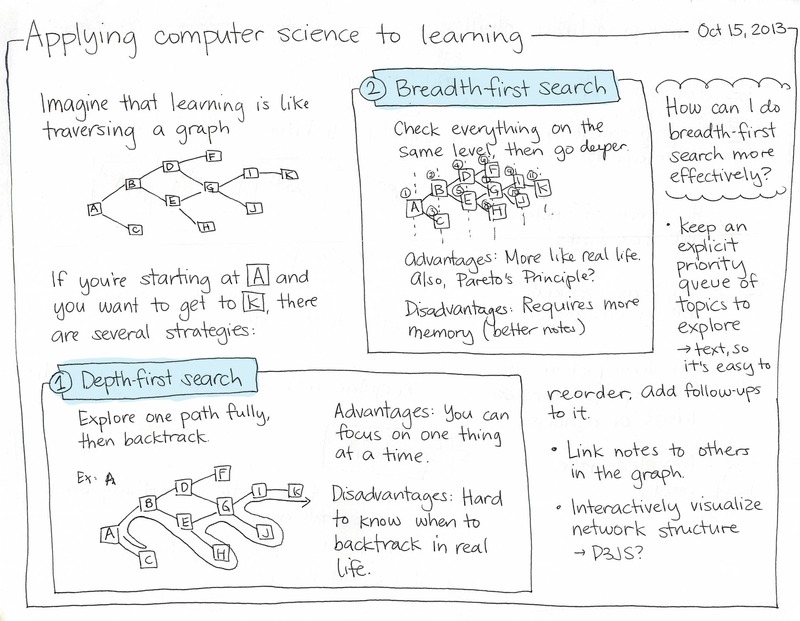 This reminded me of two computer science algorithms: depth-first search and breadth-first search. (See this animation, or the Wikipedia pages for DFS and BFS). I tend to do more of the latter than the former, and I want to get better at it. I schedule my posts in advance, so these daily themes usually aren’t about scrambling to write a post the night before. Instead, I often pick something to focus on for a week. 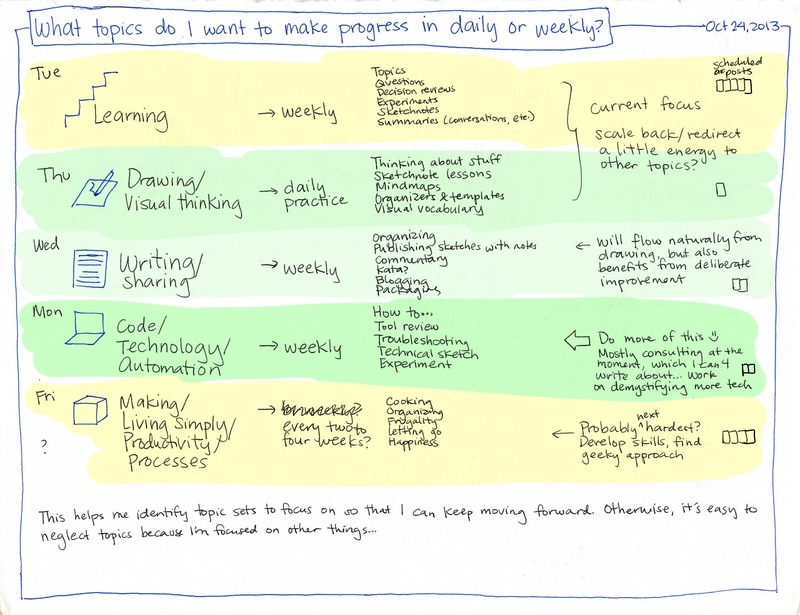 One week, I focused on mapping as part of learning, so most of my sketches and research were related to that. Then I write blog posts and schedule them for the next few weeks. 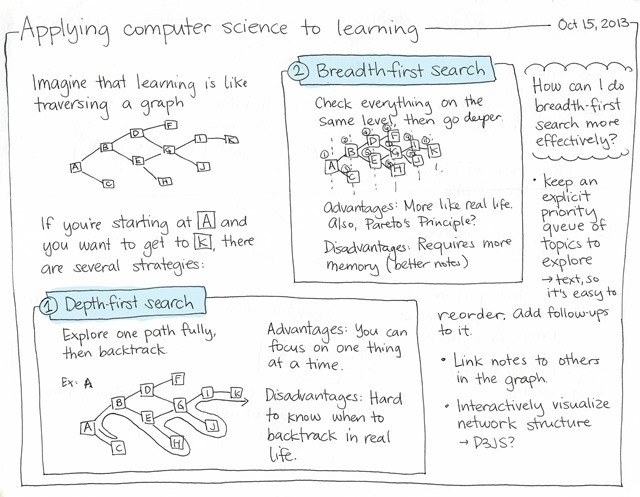 In terms of a breadth-first search, it’s like exploring the next level of subtopics below the topic, and then moving on to the next topic. I also think about other topics during the week when the opportunities come up, but I’m not as focused on them. Anyway, that’s how daily blogging supports the interests I have, nudging me to make progress in different areas. Do you have a number of interests too? How do you remember to work on different parts? In a recent blog post, Mel Chua wrote: “I’m still trying to figure out how to best store/catalogue my (growing) collection of sketches so it’s easy for people to access it.” So, here’s how I handle mine! Support my writing: Blogging, naturally. Publish most of my sketches: Blogging can take me a while, so I try to get public sketches out there as soon as possible so that they don’t get lost. Flickr and Evernote help. Flip through my sketches: Great for doing reviews and triggering memories. =) Can’t beat paging through local files manually or in a slideshow. 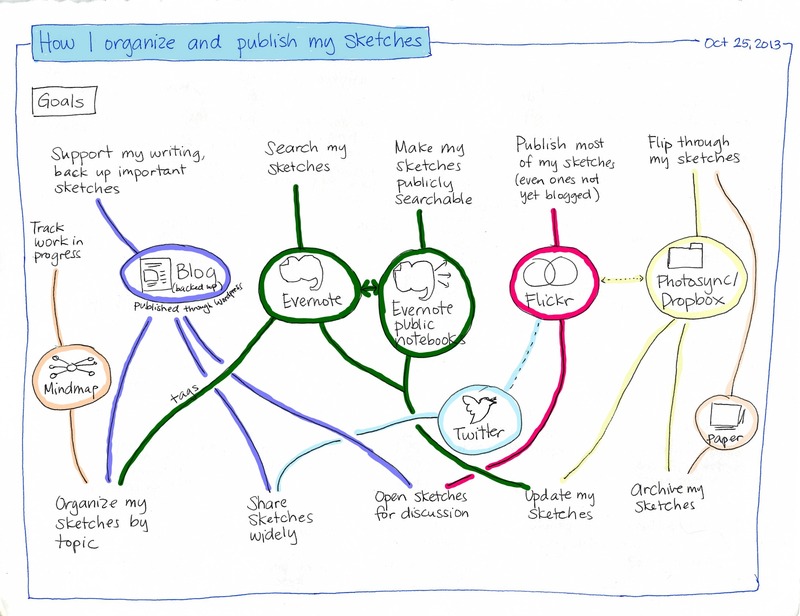 Organize my sketches by topic: Evernote, Flickr, and my blog let me tag things with keywords, while a mindmap lets me give my sketches more structure. 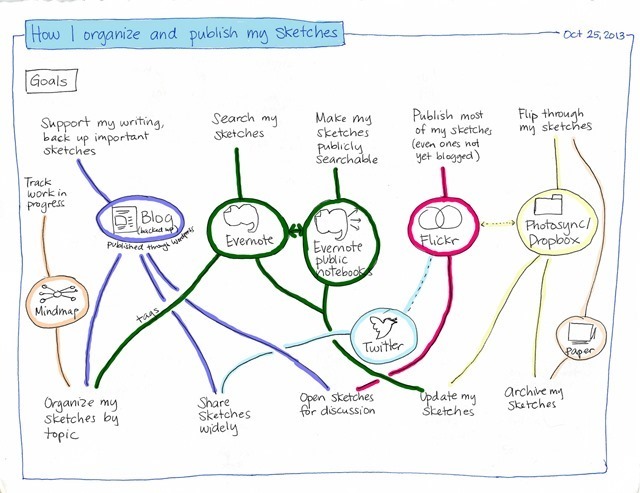 Share sketches widely: My blog and Twitter seem to be the best ways to do this, although Flickr is useful too. Open sketches for discussion: My blog is the best place for that, although Flickr and Twitter are handy as well. Update my sketches: Whether I’m colouring things in or checking off boxes, I want an easy way to get to a sketch and update it in Evernote and Flickr. If I’ve blogged about it, I’m okay with the blog post having the archived version of the image. Referring to external services in my blog posts: Flickr? The Gallery2 instance I installed? Problematic if code changes, services go down, accounts are discontinued, or (in one annoying case) my self-hosted Gallery2 gets compromised. Disk space is cheap, so I just re-publish images using WordPress’ upload mechanisms (most blogging tools handle this automatically). Picking just one way to publish stuff: Flickr is better for volume and some discussion, Evernote is better for search, my blog is better for sharing and long-term search. Since no tool has everything I need, I’ll just have to put up with the hassle of replicating information. Just using automatic organization: For the last few years, I relied on Dropbox folders and Evernote items. Dropbox folders are fine for organizing by date and Evernote’s great for tags, but I want manual organization as well – organizing things by topics and subtopics, tracking things in progress, and so on. That’s why I’m experimenting with mindmaps now. See my drawing workflow for other notes about my process. Hope this helps! I don’t write about everything. I think it might be interesting to write about more, to dig deeper into the things that people rarely write about—but since there’s so much to learn and share even in terms of topics you can talk about with complete strangers, I end up focusing on that instead. Less risky. If I’m writing about drawing, Emacs or other uncontroversially useful topics, I’m less likely to upset or offend (or bring out other odd tendencies in people). So I write more posts about that instead. I’m also learning a lot about interesting public things, so it’s not all that bad. =) Again, there’s tons to write about. But it also means that the things I’m learning about interesting, non-public things are more likely to be wasted. I don’t think keeping an anonymous blog is enough. People get de-anonymized pretty often, and I don’t want to worry about slipping up. Journals would probably be good, except that my track record of keeping paper notebooks is terrible and they are nowhere near as searchable as digital notes. Private notes in huge text files can get unwieldy and hard to review. Maybe I should use Evernote more often, and just work out some way to tag and organize the notes so that I can do the same kind of search and review that I use for my blog. Hmm, maybe a private blog, since I already have the backup strategy for that one sorted out? Maybe a private part of the current blog? Maybe that’s a good skill to figure out: how to keep good enough private notes so that I can build on them for future decisions or learning, or maybe even for time-delayed posting. How do other people manage it? How do you manage it? How do you remember well enough to be able to build on that instead of wasting the time? How do you organize notes so that they don’t disappear after you’ve forgotten about them? As it turns out, Jetpack Comments does not pay close attention to what domain the updates are coming from or to the jetpack_is_post_mailable filter that it’s supposed to be paying attention to. Sorry for the flood of test posts. I guess this is my embarrassing blog mistake for the year. Gotta have one. That is, if you can find it in your heart (and mailbox) to forgive me. Thanks to Raymond Zeitler for tactfully pointing out the problem, although I still feel terrible about it. Also, if you prefer weekly or monthly updates, we can do that too. So at least that’s something.